BCCI and IPL governing body has released the start and final date of IPL 8 season which will be starting from 8th April and will be played through 24th May 2015. This year there will be a players trading windows where teams will be able to trade players with other teams and provide the list of players they have retained. The actual auction window will take place on 16th February 2015 where players who are released by teams and some new players will go under the hammer. 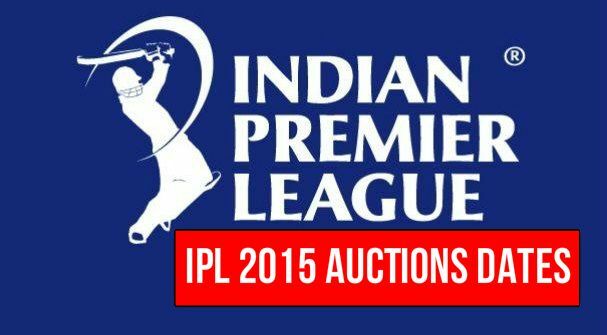 The official date for IPL 2015 auction has announced and it will take place on Monday, 16th February 2015 in Bangalore, India. BCCI first announced the auction date to be on 08-09 February but it was pushed a week later due to ongoing court battle between BCCI chairman N Srinivasan who owns shares in Chennai Super Kings and looking to transfer the ownership. So the 2015 Auction will take place on Monday, 16 February 2015, at the ITC Gardenia, Bengaluru. where team owners and officials will gather to buy players who go under the hammer. The list of players available in auction will be released shortly. There will be two trading windows first of which was opened on 6th october 2014 and lasted till 12 december in which teams retained and released the players from the squad while there were several trading between the teams as well. more details on players trading is provided below. So far only two trades has been done between teams, Mumbai Indians traded Unmukt Chand from Rajasthan Royals and R. Vinay Kumar from Kolkata knight riders. Like we mentioned before the IPL auction date is not announced yet but we will keep you updated here as soon as we get information of official date and time. the table below shows the remaining funds available to teams heading into 2015 auction. The full list of players retained by IPL teams will be updated at totalsportek.com before the IPL auction and we will keep you updated with behind the scene stuff heading into the IPL season 8. Let us know your thoughts about the upcoming season of IPL and what players you would like your team to purchase in next IPL auction.